When I explored the negative unit testing (see here) I encountered a new property MatchFirstError in ExpectedSqlException. According to MSDN, true value means that the expected severity, state, and error number must match to the first SqlError in the exception; false value – to any SqlError in the exception. I was wondering in which situations a SQL error could not be the first. If it’s not the first, it can be the second error and so on. The next question – how can I raise two errors? When SQL server executes T-SQL commands, the error interrupts that batch and raises an exception. So this error will be the the first and the only error. But when we use try – catch blocks, there can be errors both in try and catch block. Therefore there can be multiple errors. It can be check in a very simple way. We execute a code that tries to delete non-existing stored procedures in try and catch block. The result is two(!) 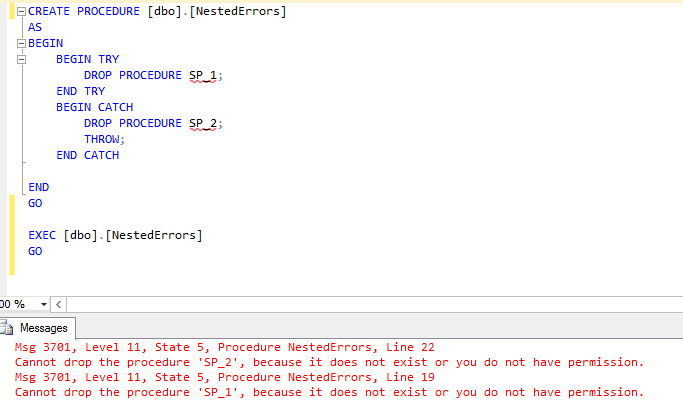 errors from one stored procedure. Let’s return back to MatchFirstError property. The default value (true) means that expected error will be the only exception or the cause of other consequent exceptions (in another words, it won’t be raised by another error).